My niece had a piano she wanted to find a new home for. Cassie had practiced on it when she had a piano class last semester. It made sense for Cassie to receive this wonderful gift. I drove, because Larry was still a little swollen. Larry backed up the trailer because I had never driven with the trailer attached. The combination worked. Mark, Kristie and Larry loaded the piano onto the trailer. This week a piano moving company will move it from the trailer to the 2nd floor of our house. He refused to open his eyes for the flash. The swelling is going down, a little. I think safety goggles are in order for future ball playing. Larry went to softball practice tonight and caught a fly ball with his face in the right field. His Rx sunglasses are mangled. His nose is scrunched and there is a nasty gash just beneath the bridge of his nose. On the up side, it appears the ball hit his nose straight on. This will prevent a need to have it reset, should it be broken. I wondered out loud if there was a safer place than outfield for Larry to play. The coach asked me if Larry was allowed to come out and play again next week. Sometimes I wonder how men ever survive to become old enough to bounce fly balls off their faces. My maternal Grandma had 4 children between 1928 and 1937. She knew how to use every resource until it was not longer use-able. The sheets I remember were flat, never fitted. That way you got more wear out of them. * When the center began to wear the sheet was split and then the side edges were sewn together and the former center became the hemmed edge. * When that became too thin the sheet was cut up into pillow cases and dish towels. * When the dish towels became to thin the fabric was used for 'snot rags'. * This legacy influences me to this day. I began saving scraps from my sewing projects when I began to sew. Originally it was every snippet. I finally set boundaries. It was every piece larger than 4 inches square. A few years ago I was intentional about gifting every sibling a 2nd patched quilt. This lead to orphaned patches that were put in storage along with the other dozen or so totes of fabric scraps. The ten sided quilt for Phil got me going again. Pre-cut strips, projects started years ago and orphaned patches have been turned into patched tops waiting for gifting with the next graduation or wedding. Here are some of finished quilt tops. The top, above, was an attempt to use up flannel scraps. It was somewhat successful but I needed to add baby corduroy found from some of Cassie's dresses to have enough to make a full quilt top. 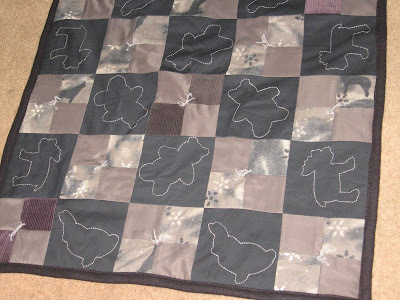 There is a baby quilt made from the remaining patches that I did not get a picture of before I gave it away. Below is '4' 9-patch blocks latticed together. Above is the baby quilt from the remaining patches. It is the world's supply of turtle printed flannel. The 9-patch quilt top below was a project that has been in progress for a few decades. I pulled the patches out of storage and realized there were finally enough wool scraps to complete it. Above is how I used up a stack of 4-patch micro ginham patches. This baby quilt was patched from a stack of patches remaining after that sewing frenzy a few years ago and the 4-patch blocks used on the other quilt.